A couple of new products have snuck their way into my makeup bag recently, so I thought I would share the things I've been reaching for lately. As I've mentioned about a thousand times; I adore my Mac Studio Fix Fluid Foundation. Perfect coverage, especially lately as I've had a terrible breakout of giant, red, angry, under-the-skin spots so I have needed something to make my skin look flawless! I am almost out of my Nars Radiant Creamy Concealer and have got it on my birthday list so I ordered the Mac Pro Longwear Concealer to tide me over until I get a new one, I usually have lots of backups of it! I definitely prefer the Nars Concealer as I just cannot fault it at all. The Mac one is okay..not amazing but it does the job. I'm still using my never-ending Charlotte Tilbury Airbrush Flawless Finish Powder which I have had for ages now, it's a really lovely non-cakey powder that makes you skin look pore less and flawless. To contour I've been loving the Kevyn Aucoin Sculpting Powder, this is perfect as it isn't too red on the skin but more grey so it is more natural on the skin. 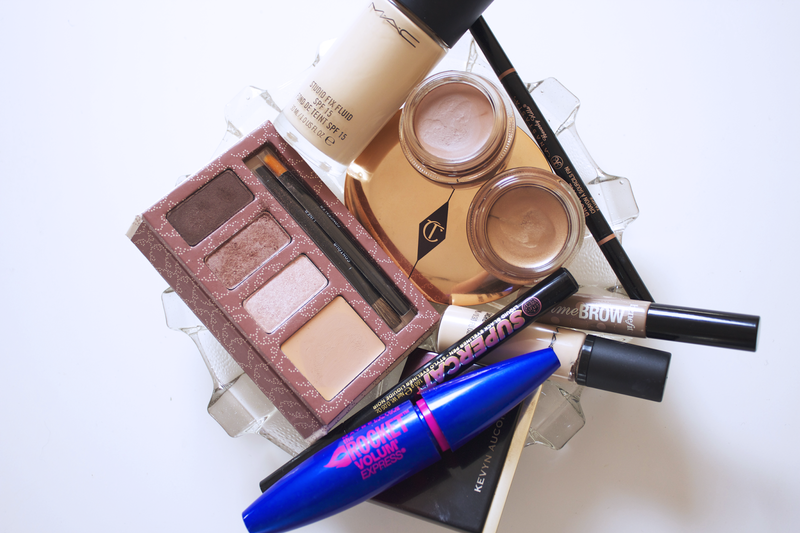 On my brows, I still use my Anastasia Brow Wiz and Benefit Gimme Brow, I recently repurchased the Benefit Gimme Brow, I love how tiny the brush is so it is very easy to use and doesn't get any product anywhere you don't need it. I recently purchased two Mac Paint Pots, Indianwood and Groundwork. The Mac Paint Pots are not as creamy as other ones I've tried but they dry very quickly and stay in place all day, both these shades are neutral, everyday, wearable ones; I especially love Indianwood! On my eyes, I bought the Benefit Big Beautiful Eyes Contour Kit, this is a great neutral eye palette, perfect for travelling as it's small and compact. I then finish with the Soap and Glory Supercat Liner and Maybelline The Rocket Mascara! Love the look of this, those paint pots are so pretty! This is definitely what my everyday makeup looks like as well!